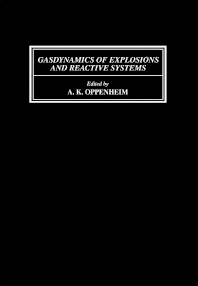 Gas Dynamics of Explosions and Reactive Systems documents the proceedings of the 6th Colloquium held at the Royal Institute of Technology in Stockholm, Sweden, 22-26 August 1977. The meeting was held under the auspices of the Royal Swedish Academy of Sciences and the International Academy of Astronautics. The scientific program included over one hundred papers. The contributions in this volume are organized into four parts. Part I contains papers on gaseous detonations. It covers topics such as theoretical model of a detonation cell; spherical detonations in hydrocarbon-air mixtures; and shock wave propagation in tubes filled with water foams. Part II presents studies on explosions, such as the detonation of hydrogen azide and propagation of a laser-supported detonation wave. Part III examines condensed phase detonations. It includes papers on the mechanism of the divergent and convergent dark waves originating at the charge boundary in detonating liquid homogeneous explosives with unstable detonation front; and initiation studies in sensitized nitromethane. Part IV presents discussions on turbulent detonations, covering topics such as the computational aspects of turbulent combustion and problems and techniques in turbulent reactive systems.